If I were to recommend a single comic book to a Silver Age newcomer which would introduce him to the DC Universe before Earth-Two became a major force (and really started complicating things), it would be "Super-Exiles of Earth" (Justice League of America #19, May 1963). 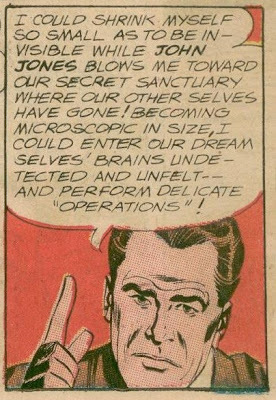 - In the very last panel, Superman mentions his "Fortress of Solitude." - Concerning action, most issues broke the then 9-member JLA into 3 teams of 3 superheroes each. Each 3-member team worked together to fight against a villain or to cope with a problem. "Super-Exiles of Earth" includes mostly one-on-one battles between each member and his/her respective evil alterego which accounts for a page in this story that has 10 panels. - And the member who contributed to solving the problem that was the ultimate climax of the story was then newcomer Atom who had joined the JLA a few issues earlier (JLA #14, "Menace of the Atom Bomb"). To justify the worth of new JLA members, it seems that writer Gardner Fox allowed the newest member to play the crucial role in providing the final solution. (Given that Ray is a research physicist, there are some questions I might have about his ability to perform the necessary brain surgery from inside). 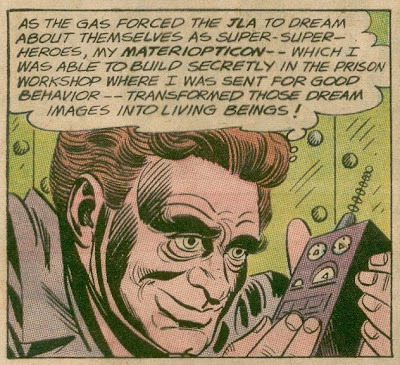 (Sekowsky did a credible job on a number of features in the Silver Age. Personally though, I am not a fan of his work. 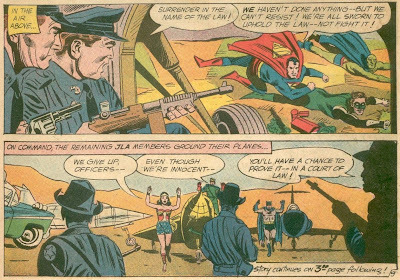 If you compare the cover of JLA #19 drawn by Murphy Anderson with the same scene as portrayed within the issue, you can see that Sekowsky's other strong point was his portrayal of emotion. 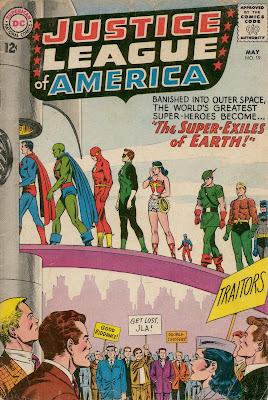 On the cover, the JLA members look stoic in accepting their exile; in Sekowsky's panel, they look like they are walking the gangplank and some of them look positively broken by having to face their cruel fate. - The page of six panels showing the villain in prison from different angles and revealing his thoughts. One of those panels didn't even include him. 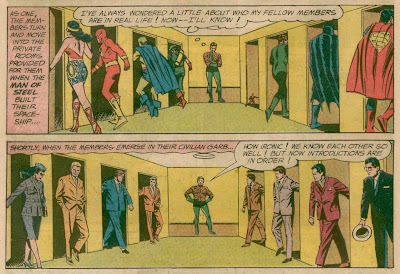 Concerning the evolution of the JLA, "Super-Exiles of Earth" represents the ending of an era when the entire JLA roll call would participate. Beginning with the first issue of the following year (1964), stories would begin to appear where only a partial roll call of members would participate and where Superman and Batman would gain the status of "anchor" members and begin to appear more regularly and prominently on JLA covers. The reduction of members was probably in reaction to the annual summer tradition of the two "Crisis" issues which must have caused Sekowsky to put in a lot of overtime drawing all those superhero (and supervillain) costumes. Re-reading JLA #19 over four decades later, I have to conclude that life in the pre-"Crisis" DC world certainly had its moments. Obvious question for the peanut gallery: Should we make guest posts a regular thing at Silver Age Comics?